Programs. Discounts. Services. Opportunities. Scholarships. 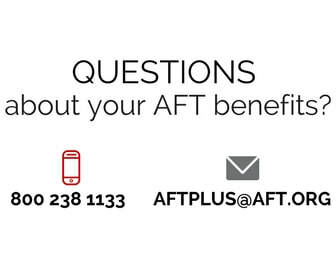 ​AFT has got you covered. TAKE ADVANTAGe of Your AFT Membership Perks. ​2019 Rollie Hopgood Future Teachers Scholarship Award Applications Now Available Online! AFT Michigan dues paying member’s son(s) and/or daughter(s) who is a graduating senior with the goal of becoming a teacher. Click here to download the applications. Applications are due no later than June 7, 2019. If you have any questions or concerns, please contact Linda Moore at tftlindamoore@gmail.com. If you are planning to buy a home this year, check out the Union Plus Mortgage Company (UPMC), a union-owned company that provides home financing options for union members and their families. The loan officers at UPMC can get you a good deal, a mortgage loan that matches your specific needs. Your fellow union members, the Sullivans from AFSCME were glad they did. "Our experience was wonderful. The ease of the online portal to upload the documents was super convenient". Encourage your child/children to apply for The AAFMCC Family Scholarship! Encourage your students to apply for the AAFMCC Community Scholarship! Application deadline: 12:00pm (noon, Eastern Time), Thursday, January 31, 2019. Since 1991, the Union Plus Scholarship Program has awarded more than $4.3 million to students of union families. Over 2,900 union families have benefited from our commitment to higher education. Award amounts: $500 to $4,000. These one-time cash awards are for study beginning in the Fall of 2019. Students may re-apply each year. Award date: May 31, 2019. During the first week of June 2019 award recipients will be notified by postal mail, and all applicants will be sent email notification. Current and retired members of unions participating in any Union Plus program, their spouses and their dependent children (as defined by IRS regulations) are eligible. Grandchildren are not eligible unless a legal dependent (as defined by IRS regulations). At least one year of continuous union membership by the applicant, applicant's spouse or parent (if applicant is a dependent). The one year membership minimum must be satisfied by May 31, 2019. Members of participating unions from the U.S., Puerto Rico, Guam and the U.S. Virgin Islands and Canada are eligible. The applicant must be accepted into a U.S. accredited college, university, community college, technical or trade school at the time the award is issued. Awards must be used for the 2019 - 2020 school year. ​The AFT is launching a free benefit to protect members against identity theft—the fastest-growing crime in America. We have partnered with CLC ID Protect to offer all members, including retirees, an ID Threat Score as well as assistance in the event you are a victim of identity theft. Members who register for the free benefit will have an opportunity to purchase additional comprehensive individual or family ID theft protection. These upgraded services include 24/7 credit monitoring, $1 million of ID theft insurance, enhanced fraud and credit resolution services, and more. Register here to get your ID Threat Score and to participate in the free program. You will need your local union number to register. Find it here. Students can enroll in the online distance-learning program with no costs for tuition, fees, or e-texts at Eastern Gateway Community College. AFT has joined with New York’s first “union bank” to offer a new home financing program. ​The program offers competitive interest rates and discounts on mortgages and refinancing solutions. Strike protection eligibility, where Amalgamated Bank will waive up to three late-payment fees if a member’s local is on strike. This program offers four 4-year, $8,000 post-secondary scholarships to students who are dependents of AFT members, as well as 10 one-time $1,000 grants to AFT members to assist with their continuing education. For more information, visit www.aft.org/member-benefits/scholarships/robert-g-porter-scholars-program. Sponsored by the Union Plus Education Foundation. The program is open to members, spouses and dependent children of unions participating in any of the Union Plus programs. For more information, visit the Union Plus Scholarship Program website. Have more fun with the help of your AFT Membership! More benefits, more perks, and more opportunities are just a click away.